The Chevy Impala isn't called the Chevy Armadillo for good reason. "Armadillo," you might say, lacks that certain drive. Same with the name Planet Patrol, which, coupled with a package description that rightly places the accompanying game in the Defender school of spacejet-versus-oncoming-missiles, leaves you expecting something as scintillating as Plan Nine from Outer Space. The name game, it turns out. has little to do with the video game, which is outstanding. Despite the limitations of the Atari VCS, Planet Patrol has exceptional graphics and the mark of a designer who must've devoured Frank Herbert's Dune trilogy in one sitting. Graphisme assez pauvre, bruitages sommaires, thème archi-connu, Planet Patrol n'avait rien de bien tentant. Et pourtant ! Ce jeu est pratiquement aussi passionnant qu'un Phoenix ou qu'un Megamania. Planet Patrol ist eines der innovativeren Shoot ‚em Ups, die während der Hochzeit des Atari 2600 erschienen. Leider war dem Modul kein großer Erfolg beschert, obwohl dieser durchaus verdient wäre. Eine solide Technik und ein abwechslungsreiches Gameplay bereiten auf jeden Fall Laune. Is this a game that is going to have the lasting appeal of Space Invaders or Defender? No, not by a long shot. However, it can be nice to play in short bursts and is therefore worth looking for if you are a fan of games like this. It will not last the longest, but it is reasonably enjoyable while it lasts. There is some selection of game modes as well, although not as much as in some games of this type. Judging the game on its own merits, Planet Patrol is a serviceable -- if not thrilling -- shooter. The problem is, there's nothing in this game that hasn't been done before, and there are other games on the 2600 that do it better. The graphics approach Activision quality in terms of sharpness and vividness, but you'll notice some flickering going on (a-la 2600 Defender). 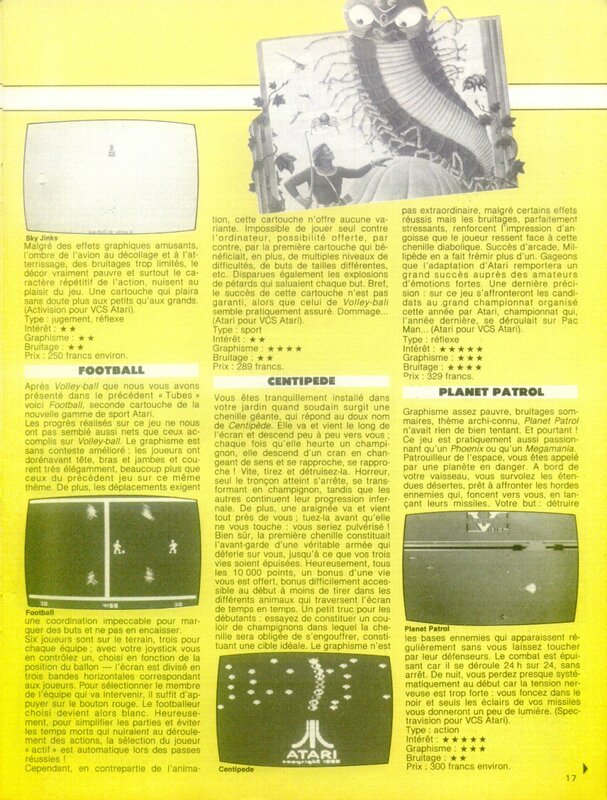 Overall, Planet Patrol is a simpler (although not necessarily easier) version of Atari's Defender. Fazit: Eine spannende Action-Cassette ohne herausragende Höhepunkte. Still, Planet Patrol is an above-average effort for a Spectravideo game and it’s clear that the company put more effort than usual into its development. It’s not a must-have, but if you like side-scrolling shooters you could do far worse. Planet Patrol Is a side scrolling shooter in which you destroy enemy ships, rescue downed pilots and destroy missile bases. Oh yeah, don't run out of fuel. It's not an outstanding game, but it offers some action and a few diversions to make it a bit different from others. We'd still rather play Defender, but this is a fun enough romp. It all sounds pretty ambitious for a 2600 game, but sloppy graphics, awful collision control, and herky-jerky animation expose Planet Patrol as the bargain-bin title it is. The refueling truck, which literally jumps across the screen, looks pathetic. Without a solid engine running the show, the sophisticated gameplay is largely wasted.